The BEA has released September's trade deficit numbers (pdf). September exports of $132.0 billion and imports of $168.4 billion resulted in a goods and services deficit of $36.5 billion, up from $30.8 billion in August, revised. 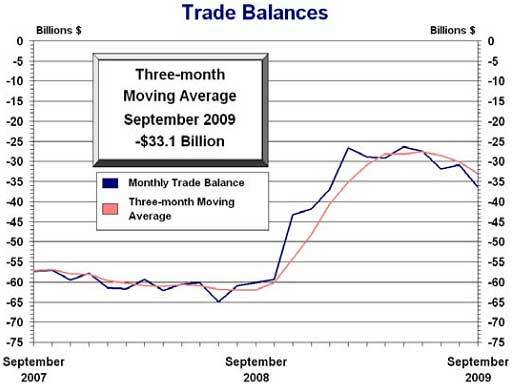 September exports were $3.7 billion more than August exports of $128.3 billion. September imports were $9.3 billion more than August imports of $159.1 billion. The deficit, which detracts from GDP, increased 5.7 billion in one month, or 18.2%. That's the largest jump in a decade. 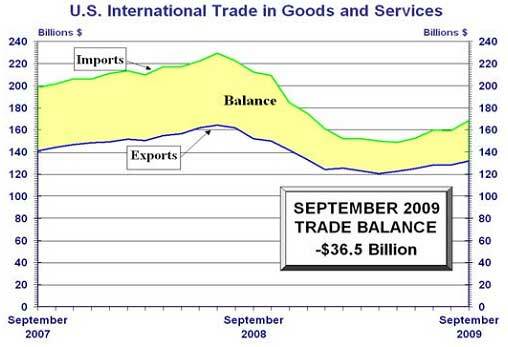 The balance of services remained stable, both imports and exports grew by $0.2 billion. Advanced technology products exports were $20.5 billion in September and imports were $26.5 billion, resulting in a deficit of $6.0 billion. Cruel Oil imports were up $4 billion from last month. Auto parts, vehicles imports increased $1.6 billion.